MR imaging of the prostate is still in an exploratory phase and is not yet advocated as a routine staging procedure. Prostate MR imaging should be performed in centers where at least 25-50 patients per year are examined and the results can be compared with histology, preferably whole mount specimen . 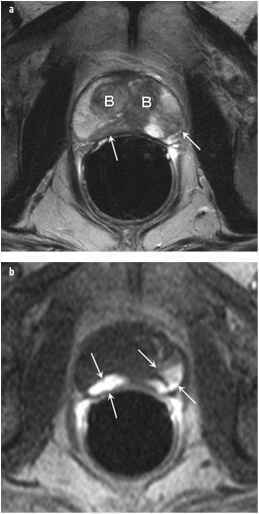 Currently, the major clinical indication for MR imaging is detection of ECE, SVI, nodal and bone marrow metastases, which are contraindications for radical prostatectomy . Prostate cancer is usually visible as a low signal intensity lesion in a bright peripheral zone on a T2-weighted image (Fig. 1). The differential diagnosis of low signal intensity areas includes cancer, hemorrhage, prostatitis, effects of hormonal or radiation treatment, benign prostate hyperplasia (BPH), scar, calcifications, smooth muscle hyperplasia, and fibromuscular hyperplasia . Hemorrhage, mostly a result from biopsy, can be differentiated from cancer by evaluation of T1-weighted images (Fig. 2). Hemorrhage is hyperintense on these images, whereas cancer has the same intensity compared to adjacent normal tissue. 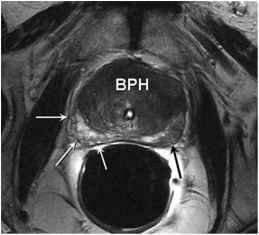 BPH, smooth muscle hyperplasia and fibromuscular hyperplasia are located mostly in the central zone (CZ) and transitional zone (TZ), whereas cancer is primarily located in the peripheral zone (PZ). Calcifications are common in all locations of the prostate; however, these may be differentiated from cancer based on their distinct oval form. 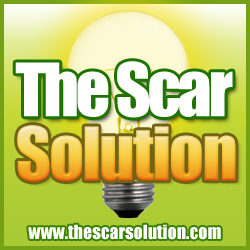 Scars are rare. Detection of cancer in the CZ and TZ is generally not possible, as this area is commonly replaced by BPH, which has an identical signal. A review of existing literature revealed that an optimal imaging protocol includes turbo/fast spin echo, at least two imaging planes, high-resolution images, and the use of an endorectal phased array coil. Reading should (preferably) be performed in consensus, using experienced readers.